Molten bright copper? Metallic gold on red? You decide. 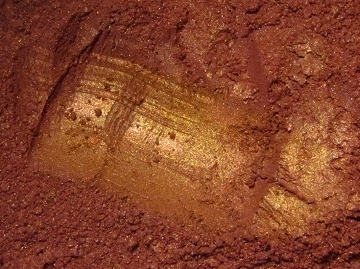 It's metallic gold on red; a firey, warm blend of hues with a metallic finish, and will appear differently depending on how it's applied, much like Mephisto. Since it has a matte base, this shade will usually work best not used over Pixie Epoxy, but patted on or fingertip-"brushed" over a regular primer to show the varying hues. Swatch applied heavily over bare skin. Primer will bring out the gold overlay.